Editor’s note: This piece is part of our week-long series previewing the 2019 Philadelphia Union season. For the full series, click here. How did Ernst Tanner’s first offseason go? Sara Griswold: A. He’s made some bold moves this offseason, moves that may have surprised us, but were necessary to make the club’s biggest signing in history as well as some other unique signings that no one else would have made. It’s his first season and he’s really trying to shake things up to get different results. Peter Andrews: Extremely well, as I wrote about in some detail in my report card. Tanner gets credit for making proactive, bold moves. He showed an ability to get real value within MLS in both the draft-pick trade with Cincy and in the Sapong deal, which is something Earnie Stewart never really mastered. Chris Gibbons: Tanner has seemed to learn the MLS ropes more quickly than most, making many of the right moves and scheming his way into unexpected others. The devil is always in the details in this league, and in short order he has them down pat. Nick Fishman: Swimmingly. Tanner was savvy bringing in additional funds by trading all draft picks and shipping C.J. Sapong to the Windy City. He also brought in a promising young striker, provided formational flexibility, and made the biggest signing in the club’s history. Shayan Waseh: B+. Despite the outgoing transfers of Borek Dockal, Keegan Rosenberry, and C.J. Sapong, the Union now have a line-up that looks primed to overcome the obstacles that plagued it last season. I would say it was a pretty good offseason by Union standards. The real question will be whether Tanner’s vision on the field will play out successfully. Mike Servedio: B. Some very bold moves from Tanner, chief among them trading Keegan Rosenberry. The trading of all of the Union’s draft picks also a big decision for Tanner, but one that points to the Union’s continuing strategy of developing and playing their Academy players. Marco Fabian appears to be the player the Union needed to replace Borek Dockal, and Kai Wagner brings some depth to the left back position (finally). Christian Sandler: Not a bad start. I don’t think Marco Fabian is going to be substantially better than Borek Dockal — I see it as more of a like-for-like replacement, which is fine. You will always need to replace 18 assists and five goals in some capacity. I’m also not sold on trading Keegan Rosenberry to Colorado, but only time will tell. Fabian is a very marketable signing and it’s clear Tanner has ambition in MLS, so you’ve got to give him credit for that. Jim O’Leary: I (Incomplete). I’m really not sure how I feel about it yet. He’s made some smart moves, like Peter mentioned. But then there’s stuff like the Rosenberry trade, or bringing back Fabinho. It’s been an interesting offseason for sure, but I’m not sure it was enough. Ryan Rose: A. First of all, let’s just soak in the fact that the season is about to begin, and we’re not still waiting to hear who the Union’s No. 10 will be. Marco Fabian is an incredible player and a no-brainer signing. Moving C.J. Sapong for so much allocation money sets them up for a really successful summer window as well. Given his resources, I’d say he’s done about as well as a Sporting Director possibly could. Dan Walsh: B. Bold, gutsy, and potentially ill-advised. Tanner has initiated a tactical revamping right after the old system started to work, and he hasn’t sufficiently revamped the roster to match it. The Fabian signing is low risk, high reward. Santos is an ideal acquisition on paper. The Sapong trade was a ripoff. But trading away your best fullback — and a local guy — when you plan to rely heavily on fullbacks is dubious, and signing guys from Germany’s third division and Austria’s second reminds me where Jay Simpson came from. What offseason move will have the biggest impact this year? Mike: Hopefully Marco Fabian. The playmaker was brought in to replace the MLS leader in assists in Dockal. He was brought in to get on the ball and be the driving creative force of the Union offense. If he struggles, I fear the Union will as well. Sara: Marco Fabian. It’s the biggest signing in the club’s history, as well as a signing that fills an obvious hole in the Union’s lineup. He should really help with the lack of goals issue the Union often have. Peter: At the risk of being obvious, it’s Marco Fabian. Fabian is a star-level player, and is the only player on the roster who could single-handedly infuse Talen Energy Stadium with a much-needed burst of energy and excitement. But “impact” isn’t necessarily positive, either. If injuries or performance issues mean that Fabian isn’t able to provide at least 90% of what Borek Dockal did last year, the Union will be in real trouble. Shayan: If Santos scores the goals that Sapong and Burke couldn’t finish last year, then it will be the difference maker. Chris G: Goalkeeper Carlos Coronel. I suspect Tanner is high enough on him to have brought him here to challenge for a starting spot. That leads me to believe there’s a real chance when the summer transfer window ends, it’s Coronel who is the Union #1 and Andre Blake finds himself on foreign shores. Nick: Keeping the Curtin open. The coach has his most talented team. Either the Union will be looking for a manager for the first time since 2014, or the club will win their first playoff game. I lean toward the latter, but something’s gotta give. Christian S: I honestly think it could be Rosenberry departing. He provided a lot going forward and not every fullback can do that. Ray Gaddis is a very good one-on-one defender, but the attack will take a step back if he’s on the pitch. Perhaps that won’t be as important in the 4-4-2 diamond, but I still think Rosenberry was an above-average MLS right back. What bold prediction do you see coming true this year? Chris G: Three Union players score more than 10 goals. Shayan: If I have to go realistically bold, I would say that the Union could get third in the Eastern Conference, finally win a playoff game, and perhaps even throw off the U.S. Open Cup Final nickname of “the Buffalo Bills of MLS.” If you want a really wild prediction, then let’s say that the Union will be in first place by Week 4. Mike: Brenden Aaronson starts 10+ games and becomes an important contributor in the Union midfield. Nick: This will be the final season in Philly for both Auston Trusty and Mark McKenzie. Sure, I could play it safe and pick one, but what fun is that. With MLS finally trending toward a selling league, it makes sense that European clubs will come a calling. Neither will be among the league’s best center backs this season, but both Trusty and McKenzie offer mouthwatering potential. Christian S: Jim Curtin will be fired before the 2020 season begins. Jim: I think David Accam is vindicated this year. On paper, he should have been a great signing last year but knowing what we know now there’s a reason why he wasn’t. With a full offseason of recovery, and a new team structure he should thrive in, he should have a very good year. Ryan: Olivier Mbaizo proves he’s better than Keegan Rosenberry. I just don’t see Ernst Tanner trading Rosenberry without someone at least as good waiting in the wings. Mbaizo had some incredible offensive play for the Steel last season, and the team seemingly likes him a lot. Dan: The diamond high press doesn’t work, because the roster has not been sufficiently remade to support it. The Union still face a number of questions. Which one is most troubling to you? Shayan: Last year, the Union were one of the best teams in the league when their possession-heavy passing game worked. If the Union’s strikers were able to finish wide open opportunities, they could have easily won an additional five matches. I’m worried about them changing the entire approach to the game rather than just upgrading their finishing. While there’s a big payoff if the transition works, there might be some steps backwards in the short-term. Peter: How committed is the coaching staff to youth? For all of the talk about how the Union are a club that plays young players, that’s really only true on defense. The Union relied for almost all of last season on an ancient midfield that’s only getting older. (They started a preseason game with Fabian, Ilsinho, Medunjanin, and Bedoya at the four midfield spots. Average age: 31.5.) It’ll be troubling if Derrick Jones, Anthony Fontana, and Brenden Aaronson don’t get legitimate opportunities to play this year. Nick: How will the club develop their Homegrown midfielders when their veterans give them the best chance to win? Sara: The forward line combination has yet to really be determined and with so many strikers on the roster, what is the right combination? This question and line could really be the cause of the Union’s fluctuations during the season. Christian S: Who’s going to score the goals? You have to score goals and you have to score them consistently. Mike: Is Jim Curtin the man to lead the club to postseason glory? The longest tenured manager in club history has yet to win a playoff game, lost three cup finals, and proven himself a stubborn tactician at times. With only a one year contract, he’ll have a short leash to get the team firing early in the season. Ryan: It has to be whether or not Jim Curtin can adapt to this system, right? Before Earnie Stewart, we saw glimpses of flexibility with Curtin, but never anything so drastic. This is a dynamic, complex system that relies on perfect execution to work. This season rests on whether or not Curtin can carry it out. Dan: Did the Union really need to jettison Earnie Stewart’s tactical vision for the club right when it finally came good? Jim: And as is traditional we still don’t know what’s going on at left back. How do you think the Union will fare in the 2019 MLS season? Peter: My heart says this might be the year they finally win a playoff game. The Union actually have a really good roster — it’s a nice blend of young guys with upside and talented, capable veterans. That being said, I’ve been covering the Union for too long to actually believe that’s the case. And I continue to believe that Jim Curtin is not the right guy to get this team over the hump. The Union will sneak into the playoffs at the 7 seed and be summarily dispatched by Atlanta United in the first round of the playoffs. Chris G: This Union side is a playoff team, probably a 5 seed. Their tactical flexibility will see them win their first playoff game in history, but their lack of depth will see them out of the playoffs before the final. Nick: The Eastern Conference isn’t as strong as it’s been in the past. Only Atlanta United and New York Red Bulls are locks to make the postseason. The rest of the spots are a coin flip. Philly will finish third, win a home playoff game, and upset the Red Bulls before losing in the conference finals. Christian S: This Union group should absolutely make the playoffs. If they don’t, it should be seen as a massive failure. I’ll take them to make it as a 5 or 6 seed and lose another road playoff match. They simply haven’t proven they can take the next step. Sara: The Union will probably have a rough start at the beginning before settling down and hopefully remaining fairly steady throughout the rest of the season. I think they’ll make the playoffs, not at the top of the conference, but not necessarily squeaking in at the last minute, more like a solid 4th or 5th place. Maybe make it to the second round of playoffs before getting knocked out, probably not going to win it all though. Jim: Honestly I think they’ll end up fourth in the East. Not because the Union are so much stronger than last season, they’re only marginally better. But Toronto without Giovinco, NYCFC without Villa, Atlanta without Almiron, all of the scary teams other than Red Bulls have gotten softer. And everyone else … Nani is probably the biggest signing and a 32-year-old from the third best team in the eighth best league in Europe is very MLS 1.0. Anything less than a playoff berth is abject failure against that competition. Mike: They should return to the playoffs and should push to host a playoff game. 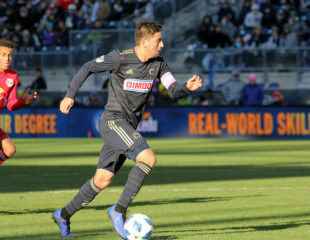 Shayan: The Union have an extremely difficult opening month, so I see them starting near the bottom and slowly getting into a groove that sees them into 3rd or 4th place in the Eastern Conference over the summer. Does that sound familiar? Whether the end of the season involves soaring and shining, or combusting in midair, I couldn’t tell you. Dan: Playoffs. The East will be worse this year. Seven teams make the playoffs now. The question is whether the Union will be better. Tanner’s tactical revamp without a full roster revamp presents a ton of variables. “Nani is probably the biggest signing and a 32-year-old from the third best team in the eighth best league in Europe is very MLS 1.0”. Have you forgot Pity Martinez? Yes, they did or I don’t think Ernst takes the job. I would imagine he believes in his system and isn’t interested in failing with a system he doesn’t believe in. The Union will limp/back into the playoffs for a customary one and done. The center backs will be exposed as the homegrown hype recipients they are and the penurious owner will sell Blake as soon as he can. All in all, we will still have a nice pitch. And why shouldn’t we? It is always full of manure. Where’s the part about the parents being sold a bucket of lies? I so miss that part of your agenda. Well this round table was definitely more interesting than those in the past. Instead of being slight variations of opinions there were actually wide margins. I definitely strongly disagree with some. All in all it was a good read. Thanks folks. Wonder who still might be coming in – dare we hope for another starting quality #8 to complement Bedoya box-to-box?